Takeaway: Harness and lanyard inspection basics. Without a doubt, anyone working at heights in any capacity these days knows the value of good safety equipment. Specifically fall protection and fall arrest equipment, like harnesses, lanyards, shock absorbers, shackles, anchor points etc.. Just as important as the correct wearing of height safety equipment is the proper care and maintenance of that equipment. For example, small particles of dirt, splashed paint or other chemicals can have a serious deteriorating effect on the synthetic fibres of webbing on a harness or lanyard and render them potentially dangerous for use. In other words, they will have a greater chance of breaking or failing when put under stress, such as in a fall. 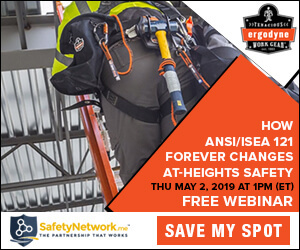 This article will provide generic advice to those workers responsible for the use of height safety equipment made from synthetic webbing, and highlight the most important elements that should be undertaken in a harness inspection regime. As well as some key preventative measures that all height safety workers should be aware of. For the purposes of this article, we won’t touch on other fall arrest hardware such as attachment points, Karibiners or shackles, as these should be inspected and tested by qualified organizations. There are many possible causes for the breakdown and failure of synthetic fibres used in webbing. These include poor use, wear and tear, UV damage, dirt, grit and chemicals. That is why it is so important that if your harnesses and lanyards are to be used to prevent loss of life or serious injury, they must undergo an effective inspection. There are many legal requirements across varying countries and organizational bodies including OHSA, British Standards and Australia/New Zealand Standards, which specify the proper selection, use, care and maintenance of synthetic webbing harnesses and lanyards including other personal protective equipment. It is recommended that you consult your local or country specific regulations or standards to ensure your inspection programs will conform and cover, at least, the minimum requirements. It is a good idea, that the competent person who is to carry out the inspections is also independent and impartial, so they can make objective decisions about discarding faulty equipment. For example, you could utilize the services provided by many of the suppliers and manufacturers of fall protection safety equipment. Pre-use checklists are an important component in any harness and lanyard inspection program. These checks, as the name suggests, should be carried out each time, before the harness or lanyard is used. A visual check of the entire harness and lanyard is conducted by passing each section of the webbing through your hand while looking for small cuts, any signs of chemical penetration or hardening of the webbing. Ensure you conduct the inspection in good lighting. It should take less than a couple of minutes to complete, but should not be rushed. A detailed inspection is more in-depth and carried out periodically as specified in your documented inspection program, but should be at least six monthly. However if you are using your harness more frequently or maybe hiring them out, then these inspection could be conducted every month. One of the most important tasks for the competent person conducting the inspections is to decide if a harness of lanyard should remain in service, or be withdrawn from service. This is where the impartiality comes into play. A lanyard or harness that has been inspected and found to have one or more of the above defects should be withdrawn from service and destroyed, or sent to the manufacturer for testing. For more on lockout/tagout procedures for faulty equipment, check out Understanding Lockout / Tagout Safety.